tiger snakes, then red-bellied black snakes. Despite the common belief that Australia has some of the most venomous snakes in the world, our new research shows being bitten by a snake is uncommon in Australia and dying from a snakebite is very rare. And of the few unlucky people to collapse after venom enters their bloodstream, a bystander performing cardiopulmonary resuscitation (CPR) is the most likely thing to save them. These are just some of the findings from 10 years of data from the Australian Snakebite Project published today in the Medical Journal of Australia. Although many people go to hospital with a suspected snakebite, many do not turn out to have envenomation (when venom enters the bloodstream) after all. In more than 90% of cases people are bitten by a non-venomous snake, venom is not injected when the snake bites (known as a “dry bite”) or are not even bitten by a snake (known as a “stick” bite). 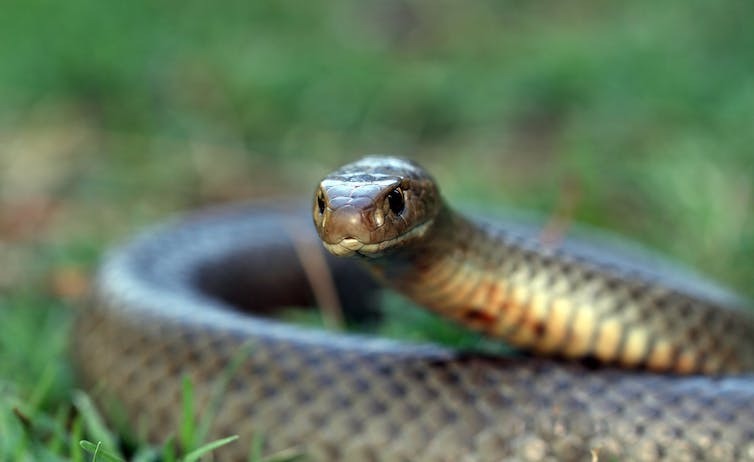 Our analysis of about 1,548 cases of suspected snakebites from all around Australia, showed there were on average just under 100 snake envenomations a year, and about two deaths a year. The most common snakebites were from brown snakes, then tiger snakes and red-bellied black snakes. Brown snakes were responsible for 40% of envenomations. Collapsing, then having a heart attack out of hospital was the most common cause of death (ten out of 23), and most deaths were from brown snakes. What happens after a snakebite and how can CPR help? Venom from a snakebite travels via the lymphatic system to the bloodstream. There, it circulates to nerves and muscles where it can cause paralysis and muscle damage. In the blood itself, the venom destroys clotting factors, which makes the blood unable to clot, increasing the risk of bleeding. In the most severe cases, most commonly in brown snake bites, someone can collapse because they have low blood pressure (we don’t know for certain what causes the low blood pressure). In this situation, insufficient blood is pumped around the body for the brain and other vital organs. Clearly the accurate diagnosis of snake envenomation and the timely administration of antivenom are essential to treating snakebites in hospital. 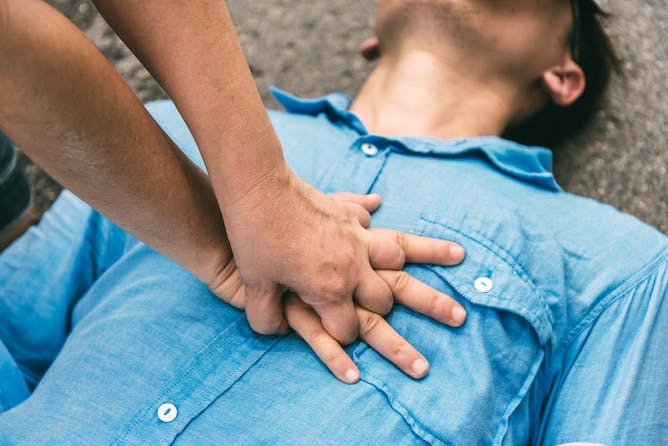 But when people collapse, CPR will keep the blood circulating to the vital organs – and is life-saving – however inexpertly a bystander performs it. If a snakebite victim collapses, CPR is vital to keep the blood circulating to the vital organs. In other words, we found basic first aid before people reached hospital, of which bystander CPR is one, may be more important than any changes in how people are treated in hospital to improve people’s chance of survival. People who survived after collapsing received CPR on average within one minute of being bitten compared with 15 minutes for those who died. Our study also showed that in most cases, people used other first-aid measures (pressure bandages and immobilising both the limb and the patient). These aim to prevent the venom travelling from the bite site, via the lymphatic system, to the bloodstream. Our study confirmed the role of antivenom in treating snakebites and the need for it to be administered before irreversible damage is done to the nervous system and paralysis occurs. However, we found one in four patients given antivenom had an allergic reaction to it and about one in 20 have severe anaphylaxis requiring urgent treatment. So it is essential only patients with snake envenomation, and not just a suspected snakebite, are treated with antivenom. We found 49 patients (around 6%) were given antivenom unnecessarily, out of the total 755 patients who received it. We know the earlier someone receives antivenom the better. Yet our study found that the time from being bitten until receiving antivenom had not improved over the study period. So we need to find ways to make sure patients get antivenom as early as possible. This requires laboratory tests that can identify patients with snake envenomation in the first couple of hours after the bite. It is also essential anyone bitten by a snake or suspected to be bitten by a snake seeks immediate medical attention and goes to hospital by ambulance. be alert inside too, with 31% of snakebites near houses and 14% in buildings. Our study confirms Australian snakes don’t really deserve their deadly reputation, unless you’re a mouse. But if you are bitten, or think you have been, hospital is still the best place for you.